Curly hair is always going to be in fashion and chances are that the straighten your hair naturally is, the curlier you will want it to be. This tale is as old as time and even people with short hair like some curls every now and then. There are many ways to obtain those curls that you so want and most of them are really innovative. To have a curly hair, you also need to have a healthy hair which is why you shouldn’t neglect this aspect. 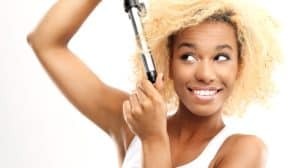 Luckily, there are several strategies and tools that you can use in order to get your hair as curly as you want to, without damaging its natural health and structure. Here are the best ways to curl your hair as soon as you are ready for such an aesthetic change and how to make them work for you! What tools you can use to curls your hair overnight? Give the classic rollers a try! Pay attention to the heat! If you use rollers, don’t tie them too tight! Curling your hair is a lot easier nowadays than it used to be decades ago. Part of this progress is the increased number of tools that one can use in the present to create the hairstyle of their dreams. Manufacturers came up with different devices and models to ease your job. Here is what you could consider when it comes to ways to curl your hair! Curling irons are the best tools to use when you want to create some waves in your hair. They are designed exactly with this purpose which also means that they will most likely give you the best result in the shortest time frame. Curling short hair can be a bit more challenging than long hair but it can be done easily if you have the right curling iron. Here’s how! Having the right curling iron is essential to your success. It needs to be thick enough to accommodate the length of your hair. Usually, the thicker the iron is, the better it works for long hair so if you need one for short her you might not need to go for a thick one. Prepare your hair for the process. Preparing your hair is also very important. After all, you need to make sure that it is strong enough to be exposed to heat without getting damaged along the way. Washing your hair will increase your chances of having better defined curls. Use a shampoo that nourishes your hair correctly and don’t forget to apply a good conditioner afterwards. Also, add a layer of thermal protector after you made sure your hair is clean in order to prevent heat from burning it. And finally, make sure that you dry your hair with a blow drier before starting to use the curling iron on it. Curl your hair. Curling your hair sounds like the most exciting part and so it is. However, you can make this step easier by splitting it in sections and curl each section at a time. Depending on the length of your hair, you might not be able to define the sections so easily but you should definitely establish a strategy when it comes to curling it up. Twist only one layer of hair around the barrel in order to get shiny and defined curls. Final touches. Once your hair is as curly as you wanted it to be, all you have left to do is to arrange it. You want your curly hair to look as natural as possible and for that, you just need to shake it a few times. Maybe arrange it slightly with your hands but definitely don’t try combing or brushing it. If you use a comb or a brush, you will damage all the hard work you put into those curls. If you don’t have a curling iron, you can very well use a flat iron and all you need is to pay a little more attention to details. Flat irons can successfully get the job done even if your hair is short, however, they are easier to use on long hair. The steps are similar to those that you would follow when you use a curling iron but there are significant differences that you need to pay attention to for your own safety. Use protective products before exposing your hair to heat. Thermal protection products should always be applied regardless to what kind of iron you are using, be it a curling one or a flat one, because both styles work with heat. So, for the sake of your hair, try not to compromise when it comes to applying such a product. You can find them as sprays and they are fairly common. Split your hair in comfortable sections. Splitting your hair in sections is an important step if you use a flat iron as well as it is if you use a curling iron. If you can’t split it, because it is too short, you can always use the iron on different sections of your hair and try to make it face different directions as well. This trick makes your hair look more natural and charmingly rebel. Use the flat iron carefully to not get burned. Since flat irons are made with the opposite effect of curling in mind, which is straightening your hair, they function different as well. But if you pay attention to the way you use such a device you eliminate all the potential hazards. Try to face the flat iron away from your face to avoid the effects of the heat and don’t keep your hair in it for more than a few seconds. These irons tend to work on higher heat and you need to protect your hair over everything else. Detangle your curls with a special comb. You can use a detangling comb to give shape and style to your new curls. Depending on the length of your hair, this might be an essential step when you want to achieve the hairstyle that you like. If your hair is too short for it, you can skip using such a comb and simply arrange your curls with your hands. However, for a hair length that reaches your shoulder, this is one of the steps that can make a great difference for the outcome. Use hairspray in moderation. Hairsprays are very efficient but you need to pay attention to the quantity you are using. The best way to apply hairspray is to spray it on your hands and use them to arrange your hair. Also, there are different types of hair sprays, some stronger and some lighter. Which one you choose is according to your expectations and the type of hairstyle that you are going for. Before curling irons and flat irons, ladies had to use rollers, a classic way to get the waves they want in their hair. And rollers are still often used nowadays as well because they bring many advantages to the curling process. They are very easy to use too, without exposing your hair to extreme heat! You can purchase plastic rollers or foam rollers and they all do a great job, plus they are reusable. Check out some really good hot rollers. Clean your hair: Just like when you use any other curling method, you also need to clean your hair well before using rollers. Wash it and allow it to dry naturally, without using a hairdryer. This is an important step for the success of your hairstyle. When the edges of your hair are dry enough but the roots remain humid, roll each section of hair on a roller and pin it tightly. Depending on the size of your rollers you will get wider curls or smaller ones. Go to bed: The rollers should be applied before you go to bed in the evening because they need several hours to take action and curl your hair the way you want it. So, place them all on your head and enjoy your night sleep, expecting to wake up with attractive and charming waves in the morning! Use a hairspray to fix the hairstyle: Once you take the rollers out, make sure your hairstyle will survive the day by applying a layer of hairspray. Don’t use any brush or comb and simply arrange your hair with your hands. And with this step, you are done curling your hair in a safe and affordable way! As attractive curly hair can be and as much you might want to obtain those waves and see others admiring them, it is a stressful process for your hair. But this stress can definitely be reduced by taking into account the following safety aspects. Remember to always make sure that your hair is not exposed to drastic risks just to get the hairstyle that you want because it might be a lot of work to fix the damages. The most important aspect to pay attention to, is the heat factor that is present when you use a curling iron or a flat iron. Usually, these devices come with the option to choose between different heat levels such as low, medium and high and they might even have a temperature control setting available. What you end up choosing depends a lot of the natural thickness of your hair, its resistance and its health. Usually, people with thicker hair have to use more heat to get their curls. But by using a thermal protection spray, you can avoid different risks or side effects of this heat exposure. These gloves are meant to protect your hands more than your hair. Most irons will come with such a glove included and you are supposed to wear it on the hand that is not holding the iron during curling process. It can be a real lifesaver and protect you against accidents and burns! These gloves don’t protect your hand entirely but they delay the burning so you might avoid the heat a little longer by wearing them when you twist your hair on the iron. You might be anxious to see the final effect of your curling process but it is a great idea for you and your hair to take some breaks as you are curling it. Don’t curl one section of hair over and over again without giving it some minutes to breathe and get some fresh air because you will only destroy your hair and make your edges split. Once you are done with a section, move on to a different one and if you need to insist on certain areas, you can always do that by the time you are done styling your hair. The auto shut off function comes in handy for those sleepy moments when you might not be all the way awake when styling your hair. The risk of not shutting off your curling iron or flat iron is high and the consequences can be tragic. However, you can use a device that will shut off automatically if it is not used for a certain period of time. More common, these devices will shut off in one hour of stand by. The above hazards are related to the usage of irons that can expose your hair at different risks so you might think that rollers is the safe way to go. While rollers are indeed safer because they don’t use heat which is a risk less you are taking, they are not completely hazard free. The main mistake that you can make is to tie the rollers too strongly and too close to your roots which will damage your roots in time and reduce your hair’s resistance. As you can see, there are many options that you can use when you want to curl your short hair and give yourself a new look without a big investment. Which method and which tools you choose is up to you and the type of hair that you have. Also, dexterity is important because you will need to wrap your hair around the iron or the rollers and pay attention to the way you split your sections in order to obtain the orientation that you want. But all the above methods can be used at home successfully so don’t hesitate to try them out if you are going for a change of look.